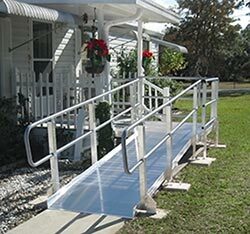 Mobility at Home is an authorized dealer for products such as modular ramp systems from leading companies Prairie View Industries (PVI) and EZ-ACCESS. These products are the strongest and lightest ramps available, proudly made in the USA. If a wooden ramp is more your need, we can build wooden ramps to fit your home too. Got a short-term need for a wheelchair ramp? Ramp rental may be the smart option! If you or a loved one is temporarily going through rehabilitation at home (or perhaps you need to accommodate a wheelchair-bound friend or relative who plans to visit), you can gain ramp access without having to own a ramp indefinitely. Our rental service includes setting up your ramp and removing it once you are finished with it. We can visit your home or company and evaluate the site to determine which product best meets your needs. Whatever your needs may be, Mobility at Home has an affordable, efficient, and effective solution for you! Configurable to meet any entry, Modular Ramp Systems provide a solution that’s quick and convenient to install. Numerous ramp lengths and platform options can be combined and put in place by Mobility at Home’s professional installers in a short period of time. Choose from a selection of colors to match the exterior of your house. They are durable and weather resistant. ADA handrail extensions, guardrails and gates are available on some models. These ramps include a number of safety features with non-skid surfaces and flush sides with no nuts or bolts protruding into the usable ramp area. Mobility at Home offers a choice of skid-resistant Folding Ramps that allow someone to easily navigate stairs and raised landings in a scooter, wheelchair or walker. 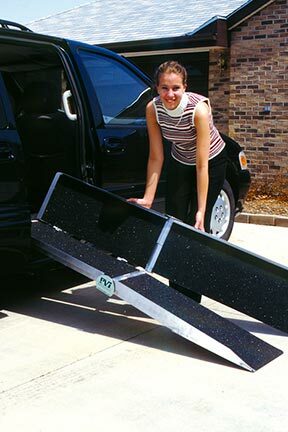 The welded aircraft grade aluminum ramps that can be folded and carried by an ergonomically designed handle. Portable ramps are great for short term ramp rentals. The EZ-ACCESS Portable Ramps come in Trifold and Suitcase style ramps designed for quick and easy use. These folding ramps are available in various lengths. Mobility at Home offers a variety of lightweight, easy-to-handle aluminum and rubber threshold ramps to make transitioning between uneven surfaces easier. Threshold Entry Ramps are designed for doorways and raised landings. 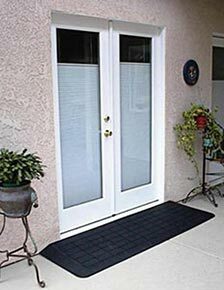 This portable wheelchair ramp simply sits against the doorsill (inside or outside) to provide a smooth ground-to-sill transition and is especially practical for sliding glass doors because it does not interfere with the door track. These products, which include limited lifetime warranties from the manufacturers, are made of rubber or aluminum that is built to support hundreds of pounds and accommodate wheelchairs and scooters with various wheel configurations. 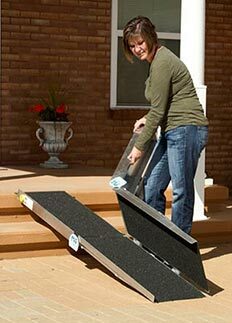 Mobility at Home can recommend a threshold ramp that is ideal for your home and your circumstances.